Stayed there last summer for 4 nights, great place very clean and staff very friendly ! Going back this summer for sure . We stayed at Bishops on our way home from a road trip to Niagara Falls, Toronto, Montreal, and Quebec City in Canada. We arrived late at night and were warmly met by George. The accommodations were very clean and comfy. We enjoyed the complimentary breakfast and our time of fellowship with the friendly owners. We highly recommend a stay at Bishops!!!! We stopped for dinner at the store and then checked AAA to get details on the Bishop Hotel across the street. This was a wonderful drop in choice! Owners were very friendly and helpful, room clean and comfortable and budget priced, and I was able to do a load of laundry too! They also had a worthy complimentary breakfast. We definitely recommend Bishops if you are traveling in the area! My husband, myself, our son and his wife, and grandchildren stayed for 2 nights Oct. 9 and 10. Check in was easy and fast; clerk was very welcoming. The rooms were ultra clean and just what we needed. The fridges and microwaves were a great plus. No noise from other rooms. The continental breakfast was great. Fruit, juice, coffee, waffles, cereal, pastries, even breakfast sandwiches. We would highly recommend this motel for anyone. Only one tiny request; to please have a couple extra pillows in the rooms. Thank you for your splendid hospitality. "This place Never Fails" This was my second stay at Bishops and I was very pleased with my stay as I was a year ago. Glen and Heidi are great innkeepers and super friendly, the rooms are spacious and the WI-FI works when your cell phone doesn't (at least my carrier). Jackman is on the old Canada Scenic Byway and an historical area of the country. The Fall colors were inviting. There is breakfast in the morning, with juice, egg and sausage and cereal as well as coffee, enough to get you on your way. There are other alternatives in Jackman but I am sold on Bishops. Recently took a mini vacation to Jackman Maine. Stayed at Bishops Motel was very pleasantly surprised how fantastic this place was. 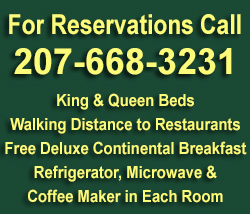 The motel was exceptionally clean, the rooms were larger than most motel rooms i have stayed at, the entire staff was extremely friendly and want to make sure your visit is the best it cAn be, they have a good above average continental breakfast. I would recommend this place without hesitation and will be going back next year.